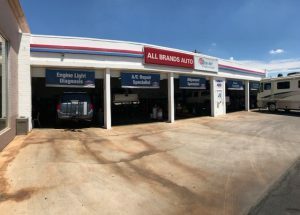 Our All Brands Auto shop may be in a tough place because of the light rail construction going on on Main Street, but that shouldn’t stop you from checking us out for ALL your auto repair and transmission repair services. For over 30 years as a locally owned business, we have been known for delivering the best quality of repair work for cars, trucks and RV’s at the LOWEST costs! Did you see our REAL customer car and truck repair reviews in Yelp and Google???? We use genuine parts and hire Genuine, honest and friendly mechanics. Our guys- Steve, Ralph and Jerry have been here for over a decade each! Besides offering free courtesy check for any problem, rattle or light you see in your car, we can repair, and service EVERYTHING and ANYTHING! And if you need a more comprehensive diagnostic test, we have the most modern, up-to-date machines and tools to find the problem. See below for several of our services!